Pompe's disease (glycogen storage disease Type 2, acid maltase deficiency) is characterized by a progressive myopathy due to accumulation of glycogen in skeletal muscles in addition to various tissues. Late onset Pompe's disease is characterized by slowly progressive proximal myopathy with respiratory muscle involvement. We present the case of a 16-year-old female presenting with proximal muscle weakness with calf hypertrophy diagnosed to be late onset Pompe's disease. This case highlights the need to consider Pompe's disease in the differential diagnosis of calf muscle hypertrophy, in patients with proximal myopathy even without overt respiratory muscle involvement. Pompe's disease (glycogen storage disease Type 2, acid maltase deficiency) is characterized by deficiency of the lysosomal enzyme acid maltase which results in accumulation of glycogen in lysosomes and cytoplasm. Two clinical forms are identified, infantile-onset form, and late-onset disease. Late-onset form is suspected in individuals with proximal muscle weakness and respiratory insufficiency without clinically apparent cardiac involvement. We report a case of late onset Pompe's disease diagnosed in an adolescent female who presented with proximal muscle weakness and calf hypertrophy alone, without any clinical evidence of respiratory muscle involvement over the disease course of 6 years. A 16-year-old school going girl resident of a coastal region of South India presented with insidious onset slowly progressive proximal muscle weakness of both lower limbs of 6 years duration. She had noticed difficulty in getting up from squatting position, and in climbing steps initially which progressed into difficulty even in getting up from bed requiring the support of her upper limbs to get up. She also noticed enlargement and rubbery hardening of calf muscles bilaterally. There was no history of fasiculations, pain, or cramps. There was no history of diplopia or difficulty chewing or episodes of darkening of urine after exertion. Past medical history was unremarkable except for a history of febrile seizure at the age of 1 year. There was no family history of similar illnesses or muscle diseases. There was no history of exposure to toxins or drugs. On examination, she had normal vitals and general physical examination. There was no rash or muscle tenderness. Her higher mental status examination was normal with Folstein mini-mental state examination score of 30/30. Her cranial nerves were normal with a normal optic fundus. Motor system examination revealed bilateral deltoid, supraspinatus, infraspinatus, and thigh muscle wasting with bilateral calf muscle hypertrophy with a rubbery firm feel on palpation [Figure 1] (calf diameter 35.5 cm when measured 10 cm below the anterior tibial tuberousity compared to a thigh diameter of 38.5 cm measured 18 cm above the upper border of patella). Proximal upper limb power was of Medical Research Council (MRC) grade 4+/5, and lower limb grade 4/5 bilaterally. Distal limb muscles were normal. No percussion myotonia or involuntary movements were noted. Sensory examination was normal and tendon reflexes were elicited normally and symmetric. There were no signs of incoordination. Investigations revealed a normal blood routine examination. Liver and renal function tests were normal. Thyroid function was normal with viral screen negative. Creatine kinase was elevated (2427 IU/L). Electrodiagnostic studies revealed normal nerve conduction amplitudes and velocities in all four limbs and myopathic pattern on electromyography. A 12-lead electrocardiography and echocardiography was normal. Pulmonary function test done revealed a mild reduction in lung volumes due to poor effort. Biopsy of the left vastus lateralis muscle revealed vacuolating myopathy with vacuoles staining Periodic acid-Schiff positive. Acid maltase activity estimation in leukocytes (chromogenic assay; glycogen substrate with maltase inhibitor-acarbose) showed a partial deficiency (2.5% of mean normal) of enzyme activity, consistent with the diagnosis of late-onset Pompe's disease. The patient was considered for enzyme replacement therapy. Late onset Pompe's disease is characterized by slower progression with symptoms primarily related to progressive dysfunction of skeletal and respiratory musculature. The patient in the above report did not have symptoms about the respiratory system during the 6 years disease course. Calf muscle hypertrophy in Pompe's disease is a seldom quoted sign, the exact incidence being unknown. The presentation of an adolescent female with limb-girdle pattern of weakness and calf hypertrophy had initially led to the consideration of other myopathies including limb-girdle myopathies in the patient. 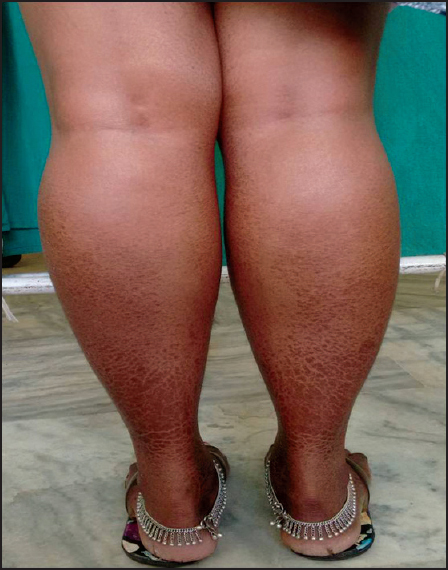 The presentation of an adolescent female with limb-girdle pattern of weakness and calf hypertrophy had initially led to the consideration of other muscle diseases including limb-girdle muscular dystrophies in the patient. The above case highlights the varied presentation of a rare disease mimicking other clinically common diseases. Enzyme replacement therapy with alpha-glucosidase enzyme has been found to be associated with improved walking distance and stability of pulmonary function in late onset Pompe's disease. Hence, this treatable condition should not be missed. Late onset Pompe's disease needs to be considered as a differential diagnosis in cases presenting with proximal muscle weakness with respiratory muscle involvement. However, due to its varied phenotypic expression, the mere absence of overt respiratory muscle involvement does not point against Pompe's disease. In such cases, further evaluation with enzymatic assays must be done to rule it out, especially since it is a treatable muscle disease. Raben N, Plotz P, Byrne BJ. Acid alpha-glucosidase deficiency (glycogenosis type II, Pompe disease). Curr Mol Med 2002;2:145-66. Orth M, Mundegar RR. Effect of acid maltase deficiency on the endosomal/lysosomal system and glucose transporter 4. Neuromuscul Disord 2003;13:49-54. Case LE, Kishnani PS. Physical therapy management of Pompe disease. Genet Med 2006;8:318-27.
van der Ploeg AT, Clemens PR, Corzo D, Escolar DM, Florence J, Groeneveld GJ, et al. A randomized study of alglucosidase alfa in late-onset Pompe's disease. N Engl J Med 2010;362:1396-406.